Cloudflare Inc., a website performance, and security company recently launched a new free public Domain Name System (DNS) service with 1.1.1.1 as its IP address. With the introduction of the 1.1.1.1 DNS service, Cloudflare’s is looking to increase internet connection speeds for everyone. For those unaware, DNS is a set of numbers that is assigned by your respective ISPs (Internet Service Providers) to connect to the World Wide Web (www). A DNS service/server is a network component that translates the name of the website you want to visit into the IP address that matches that website and then connects to your ISP to load pages over the web. In other words, it translates more readily memorized domain names to the numerical IP addresses needed for the purpose of locating and identifying computer services and devices with the underlying network protocols. By providing a worldwide, distributed directory service, the DNS is an essential component of the functionality of the Internet. Why is your ISPs DNS slow in comparison to Cloudflare’s DNS? Basically, your ISP is into the business of providing you with the Internet to make money. Naturally, they try to squeeze as many DNS’s as possible out of the range that is available to them. Each time you connect to your ISP, it assigns you a dynamic IP address through which you connect to the Internet. This often creates slow relay speeds and connection issues. On the other hand, Cloudflare claims that their new 1.1.1.1 DNS service is now 28% faster than any other DNS services like OpenDNS or GoogleDNS, as computer/smartphone/tablet will start determining domain names within a blazing-fast speed of 14.8 milliseconds. Further, Cloudflare also focuses on maintaining user’s privacy by stopping ISPs from collecting their browser history. The new service would be committed to going beyond not using browsing data to help target advertising for which they have hired KPMG to examine its systems and audit their code and practices to guarantee it’s not actually collecting users’ data. It will also not be logging querying IP address permanently and would clean out all logs within 24 hours unlike other 3rd party DNS services, which knows everything that the user does on the Internet. We are going to show you how you can change your default DNS to Cloudflare DNS on devices like Windows PC, Mac PC, and Android that will provide you the maximum bandwidth limit and give you better internet speed. If you don’t like the new settings, you can always switch back to the default DNS settings of your ISP. Step 1: Firstly, go to the Control Panel in your Windows PC and select Network and Internet > Network and Sharing Center. Step 2: Click on ‘Change adapter settings’. Step 3: Here you will see all the available networks. Right-click on the Wi-Fi network you are connected to, and then click Properties. Step 4: Click on ‘Networking Tab’ and under this tab select the option Internet Protocol Version 4 (TCP/IPv4) and then click on Properties. Step 6: Click on Ok, then close and then restart your network. Step 2: Search for DNS Servers and tap it. Step 3: Click the + button to add a DNS Server and enter 1.1.1.1 and 1.0.0.1 (for redundancy). Step 4: Click Ok and then Apply. Step 1: Connect to your preferred Wi-Fi network. Step 2: Go to your browser and enter your router’s gateway IP address. Fill in your username and password, if asked. Step 3: Locate the DNS server settings in your router’s configuration page. Then, enter any existing DNS server entries for future reference. Step 5: Save your settings, and then restart your browser. By following the methods above for respective devices, you would be surfing the Internet using Cloudflare’s new 1.1.1.1 DNS service. 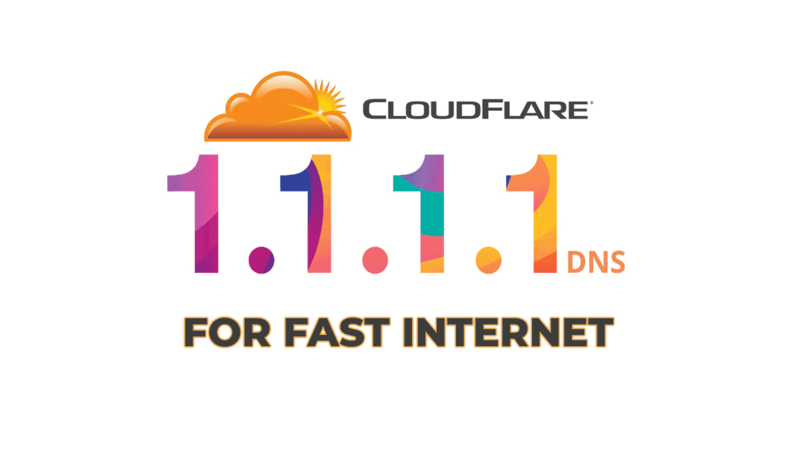 Do let us know about the internet connection speeds you are experiencing by changing to Cloudflare’s new 1.1.1.1 DNS service in the comments section below.